A cairn commemorates eighteen people who were killed in the crash of the "Kyeema". The plaque on the cairn was unveiled on the 40th anniversary of the disaster. The "Kyeema" was one of Australian National Airways DC-2 passenger planes and was flying from Adelaide to Melbourne. It crashed into Mount Dandenong obscured by fog apparently because the crew had mistaken either Sunbury or Gisborne for Daysleford, and believed they were leaving cloud cover for the approach to Essendon when they crashed. As a result of the enquiry, Flight Checking Officers were appointed to airports to monitor the progress of aircraft, advise pilots of their position in relation to other aircraft, and alternative aerodromes. This was the birth of air traffic control in Australia. It was also decided to install a radio beacon system at airports so that pilots could receive instant information on their course rather than waiting for a ground radio operator. Fifty Metres below this point on 25 Oct. 1938, Australian National Airways DC-2 `Kyeema` plunged to destruction while the mountain was enveloped in cloud. All 18 persons on board perished. From the recommendations of the subsequent enquiry have evolved the air traffic control systems in use throughout Australia today. 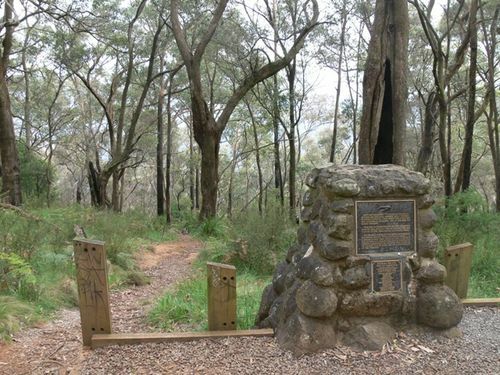 This plaque, placed by the Mount Dandenong Hisotircal Society with assistance from G. Cramp & Sons, Thos. Hardy & Sons, S. Smith & Son, Australian Federation of Air Pilots and Forests Commission of Victoria , was unveiled on 25 Oct. 1978 to mark the 40th anniversary of the disaster. Charles Hawker M. H. R.